With enthusiasm, humor, and conviction, author/speaker SUSIE LARSON has spoken to thousands of women locally, nationally, and internationally. She is a member of the Advanced Writers and Speakers Association, Women in Christian Media, and serves on the board of directors for the Christian Authors Network. Susie also serves a regular guest host for Along the Way, a two-hour talk radio show. In addition to authoring several books and many articles, Susie works as a freelance writer for Focus on the Family, and has been featured as a guest on radio and TV programs across the country, including Moody Midday Connection, Family Life Today, Chris Fabry Live!, The Harvest Show, and the LIFE Today Show with James and Betty Robison. While in Washington D.C., Susie and her husband Kevin, along with Troy and Sara Groves, represented International Justice Mission's concerns in meetings with Congress as part of their efforts to abolish and prevent human trafficking and slavery. The four of them serve as co-chairs for the IJM benefit banquet in Minnesota. Susie comes with a passion to share the love of a Savior who will never let us go. IJM, among other things, rescues young girls from the horrific life of human trafficking (visit www.ijm.org ). 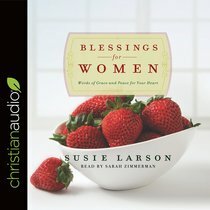 Customer Reviews For "Blessings For Women (Unabridged, 2 Cds)"